Editor’s note: Updated October 2018. Coverage by a news outlet. Product reviews (from magazines or user-generated directories such as Yelp) . Paid media: Any media placements that you pay a third party to create and/or promote (sponsored content, social media ads). Many marketing strategists would have you believe that earned media is the “Holy Grail,” of content marketing. They’re not entirely wrong – it has value to any content marketing campaign, and in a sense, it’s your end goal. But in the same sense that receiving a medal is the end goal for running a marathon. The medal might be motivation for competing, but it won’t physically help you reach the finish line. “Running the marathon” in this analogy is generating owned and paid content. The earned media is your medal. And yes, earning a medal boosts your credibility as an athlete, just as this type of media boosts the credibility of your brand. 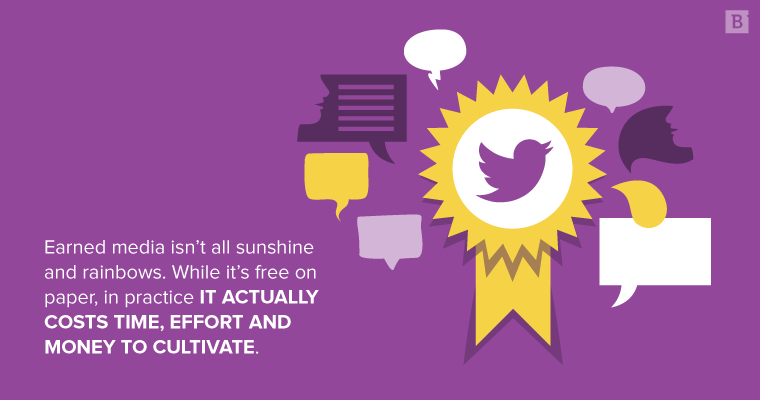 But in marathons and in content marketing, you have to be willing to put the work in first to get your due prize (if there’s only one thing you take from this post, let it be that). 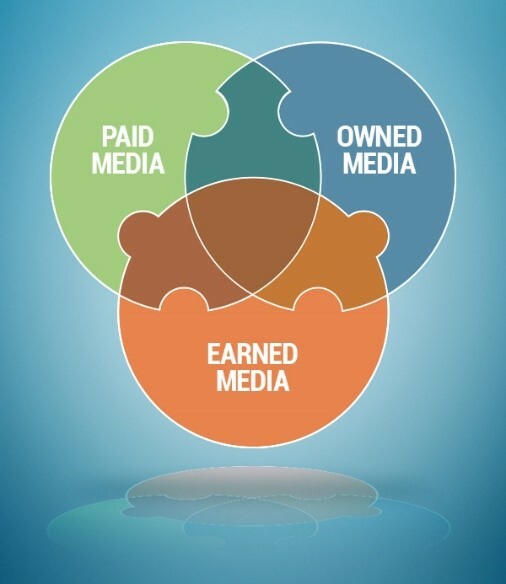 What’s so great about earned media? Audiences (especially B2B) are usually aware when the message is controlled by brand marketers and tend to be more receptive to brand coverage when it comes from an impartial column writer, a post their peers share on social media or reviews on Tripadvisor, for instance. These trusted media sources are generally called “influencers” since they’re speaking from a position that makes an audience inherently more likely to listen to them. They don’t necessarily have to be famous; they just have to be someone your audience trusts (existing customers, reviewers, news sources, etc.). The point of word-of-mouth marketing is to get these influencers talking about your brand. If you succeed, you “earn” media. But earning media isn’t all sunshine and rainbows. While it’s free on paper, in practice it actually costs time, effort and money to cultivate, and it’s really difficult to measure return on investment (we’ll get into that later in this post). Simply put, not everything you earn is necessarily good. The CliffNotes version of your earned media strategy is this: Identify your influencers and convert them into advocates who improve brand awareness for you. Obviously there’s a lot more to it in practice. For starters, earned media doesn’t live in a vacuum. In fact, with the notable exception of Tesla, we can’t think of a single company off the top of our heads that uses this strategy exclusively. Even Apple, the world’s most profitable organization, generates content and pays for advertising. As you can clearly see, earned, paid and owned media overlap with one another. Your paid media (ads, PPC) might be how you promote your owned media (blog posts and gated collateral). In this sense, earned media follows paid and owned media, assuming you take steps to get your content promoted by users and other influencers – which is kind of a must in today’s marketing landscape. “In a world where there is a content surplus and attention deficit, it’s critical to surround-sound audiences with all forms of content – earned coverage, influencer, owned content (white papers, blogs, etc.) and social (both paid and organic),” Brito told Brafton. And increasingly, businesses are wisening up to the fact that they can strategically encourage people to speak on their brand’s behalf. Ah yes, influencer marketing. It really goes for the jugular if you do it right. But paying influencers to tout your brand is expensive and, according to Tara Hunt, founder of Truly Social Inc., you’re setting yourself up for failure if you pour money directly into influencer marketing. Her very prudent advice is to become an influencer yourself. If you create original, shareable content that resonates with your industry thought leaders and your target audiences, and you do this on a continual basis (which by the way, Hunt argues is much, much cheaper than just paying influencers outright), you can build a sort of positive consensus on the web about your brand. And if you can do that, you can start to earn media from even the most objective, impartial parties (e.g., journalists). You might call this content marketing, digital marketing, top-of-funnel marketing, and so on and so forth. But at the end of the day, it all fits under the umbrella of owned media, and all of it is vital the for the development of earned media. Conferences and trade shows tend to attract press coverage. Your industry peers, partners, competitors and potential customers will all be under one roof; what better opportunity to spread your brand through word of mouth? Industry thought leaders (aka, influencers) have been to known to be in attendance; get their attention, and they might just get your target audience’s attention for you. You’ll need to distinguish your presence somehow. If you have visually interesting products, display them. If you’re more service-oriented, make sure your presentations are backed up with visually engaging content (slideshows, graphs, infographics, etc.). Be clever. One of our clients who manufactures data center power strips set up charging stations at an industry conference, delivering a product demo and some much-needed smartphone juice in one maneuver. Another raffled off an all-expenses paid trip to their Florida headquarters. Your goal is to be remembered, so do something memorable. Twitter, Facebook, Tumblr, LinkedIn, Instagram, Snapchat – you name it. Wherever people are talking, you want them to be talking about your brand. With earned social media, your goal is to get them having their own discussions, not necessarily just responding to you post by post. Nothing is more effective in this regard than the good old-fashioned user-generated campaign. In some cases, starting a good conversation is just a matter of being attentive to your social channels. For example, when @carterjwm tweeted Wendy’s asking “how many retweets for a year of free chicken nuggets,” the fast food enterprise responded with “18 million.” And so began the #NuggsForCarter campaign on Twitter. Imagine if the social media manager had snoozed on that one. Clearly, with a lot to think about. And to avoid making this leviathan of a post any longer, we’ll leave you with a final thought: measuring earned media’s ROI. Sure, if your recent video production goes viral and your lead count increases, that’s clear value. Another decent indicator is impressions and engagement metrics on social media. This is a great way of confirming that at the very least, you’re starting relevant conversations with potential influencers and driving up total conversion opportunities (even if at a high level). In cases where leads didn’t come in through any apparent point in your sales funnel, you can just ask the question: How did you hear about us? It’s possible one (or many) of your influencers put them on the fast track to conversion. But if you want to get really scientific about it, Brito recommends using reporting and analytics tools like NewsWhip and TrendKite to track the performance of your earned and converged media campaigns. Even then, earned media is a bit of a wildcard in that won’t always know which part of the funnel it will bring your leads to, which makes it difficult to track. Still, numbers have a way of telling a story, and the answers may lie in your residual dividends. All we can say with certainty is this: You won’t see ROI on earned media until you see ROI on your owned and paid media. Unless you’re Tesla of course, in which case, we can’t wait to see what you blast into outer space next.